The 45 ACP is one of the most popular handgun rounds in America. 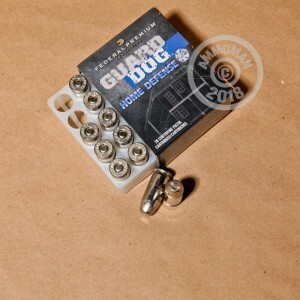 With it's exceptional stopping power and reliability, this round is one of the best for self defense. 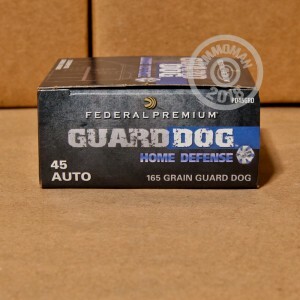 If you are looking for ammunition that delivers exceptional terminal performance and exhibits the reliability and function of FMJ rounds, then these Guard Dog EFMJs are for you. 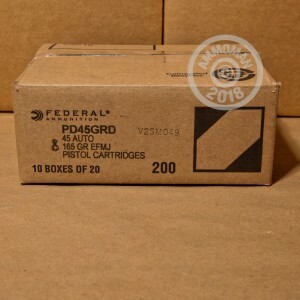 Federal Premium has been around since 1922 and they have made a great reputation for themselves. These 165 grain, expanding full metal jacket rounds are fantastic for self defense, providing you with the Federal Premium quality you need. These EFMJs load and feed just like ball ammunition but upon impact, strategically weakened sections of the projectile split and the bullet demonstrates controlled expansion. Don't forget, at AmmoMan.com any order over $99 will ship for FREE, so stock up and save!